Apple appears to be asking some high profile app developers and partners to have their Apple Watch-compatible iPhone apps prepared and ready to launch in the App Store in mid-February. According to a source that spoke to MacRumors, Apple has asked one of its biggest Apple Pay partners to prepare an iOS application with WatchKit support that's ready to launch in the App Store by February 12. It is unclear if Apple is asking the same of other developers, but it is possible the company is hoping to test some third-party Apple Watch apps with employees ahead of the device's launch to get a better feel for battery life when using non-Apple apps. As we detailed earlier today, thousands of Apple employees in the Cupertino area are wearing and testing the device on a daily basis to work out final kinks ahead of an April launch. It's also possible that Apple could use this high-profile partner's app in an upcoming demonstration or launch event to show off how Apple Pay works on the Apple Watch. Apple Pay will be a key function of the Apple Watch, letting users authorize credit card payments right from their wrists. As has been outlined in the past, the Apple Watch will authenticate payments biometrically, requiring a passcode when the device is first placed on a wrist and again if it loses skin contact. Apple CEO Tim Cook said earlier this week that Apple Watch development is on track and that the device will launch at some point in April. 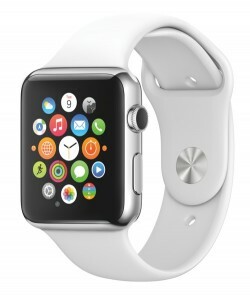 Pricing for the Apple Watch is largely unknown, but will start at $349 for the least expensive option. I would love for them to demo my Watch app.. Sounds to me like Apple wants to showcase a few Apple Watch apps in realtime for a potential event in February. More like Apple wants to have real apps running on the watch so they can film better commercials. If the watch launches in mid-April, that will give Apple's ad agency (or in-house marketing group) two months. Plenty of time. Not sure that Apple really needs to do another Apple Watch event. Another pre-launch event will only lessen the impact of the actual launch. They really need to get this thing under the $200 mark. Look at the pebble steel, thats at the $200 and it doesn't have half the features that the apple watch has. Look at the iPad, that was (and still is) very expensive, especially when comparing it to a laptop, but its still a great device that defined a new market. The cost of most apple devices is a little high and people are constantly moaning about the cost of this product or that. For me though, the cost is usually worth it. This is why they announced the thing so darned early. They know that they need to really explain what it's for before it launches so much more than they have had to for past products. If they're only getting apps ready for mid February, then they need time to test them. Event is more likely March, since Tim said April for launch. Crackpot theory: they'll launch the "Edition" a couple of months earlier than the other two. Sounds to me like some Apple execs are planning on giving Watches to their significant others for Valentine's Day, and want to make sure they have some apps to play with. It's clear that we haven't seen the entire picture. Apple wouldn't reveal the killer features of the AppleWatch nearly a year ahead of time. My bet is on a March Apple Watch event where a major unannounced feature will be revealed. I think we might see the Beats purchase leveraged. I imagine wireless earbuds that work with Siri to give the user a "Her" like experience where they can interact with Siri throughout the day. Lift your wrist to talk, receiving responses in your ear via Siri with visual info displayed on the watch. This is something made convenient with a watch, less so with a phone you have to pull out of your pocket to interact.